According to Vandergrift and Goh (2o12:loc 360), “metacognition, or the act of thinking about thinking, refers to the ability of learners to control their thoughts and to regulate their own learning.” They go on to explain that despite the fact that metacognition is key to listening (the focus of their text), its role in the classroom remains minimal. I believe metacognition is a crucial part of language learning in general, but even broadening the scope in this way, I suspect the degree to which it is integrated into language learning is probably still fairly minimal, as with listening. Indeed, in my own language learning at school and university, I can remember there being a lot of content – grammar, vocabulary etc – but I don’t remember learning how to regulate my own learning or being helped to develop metacognitive awareness. I managed, however, to learn reasonably well in the end – I did German to A-level and French up to university level, getting good results. So what difference does metacognition and metacognitive awareness make to language learning? If I managed well enough with French and German, without any, or perhaps very little, metacognitive awareness, doesn’t that suggest it’s not really necessary as long as your teacher tells you what activities to do and when? I went to work in Indonesia in 2010, and was there for a year and a half. I’d just done my CELTA. I spoke no Indonesian prior to arriving – other than a smattering of phrases that I taught myself before I left home. I did manage to learn a little bit of Indonesian while in the country, but not much. I was keen but my efforts were clumsy and ill-informed, with very little in the way of success, so I then got demotivated, as well as losing confidence, so learning was very minimal overall. Then I did my M.A. in ELT and Delta, and actually learnt a bit more about how languages are learnt and taught, coming across all manner of theories and being encouraged to consider them all critically. I came to Italy to work last September. This time, I have had much greater resources to draw on in my language learning. I’ve been able to apply what I’ve learnt about learning and teaching English to my own learning of Italian, and, in 7 months of self-study, get myself from complete beginner to (very) low pre-intermediate level (though I sometimes still sound like a total beginner when I get my tongue all in knots! :-p ). Obviously I’ve benefitted from my knowledge of French, but I’d argue that here, it’s not just the fact that I speak French that helps, but the fact that I’m aware of how to use that skill/knowledge to my benefit while learning Italian. I’ve been able to use a whole range of metacognitive and language learning strategies that I wasn’t able to use while learning Indonesian, as well as a range of task types, clear in my understanding of what I could achieve in using them and how to maximise that benefit. As well as not being put off by initial difficulties e.g not understanding what I was listening to when I first starting watching things without subtitles. This is part of what Vandergrift and Goh (2012) would refer to as strategy knowledge and task knowledge. I’ve also been able to manage my motivation a lot better and avoid getting discouraged when progress has been slow or when I thought I’d never get out of my “silent period“, for example. This is part of what Vandergrift and Goh (ibid) would refer to as person knowledge. I would suggest that as learners spend the majority of their time outside the classroom and mostly don’t have the opportunity to do whole courses devoted to theories of learning and how to learn, it is up to us, as language teachers, to ensure that we help them develop sufficient metacognitive knowledge and understanding of how language learning works – how to approach tasks, how the tasks can be beneficial, what strategies you can use to gain the most benefit from them etc – for them to be able to help themselves learn without the teacher always telling them exactly what to do and when (so that they are able to learn outside of the classroom), and, all-importantly, manage their own motivation. 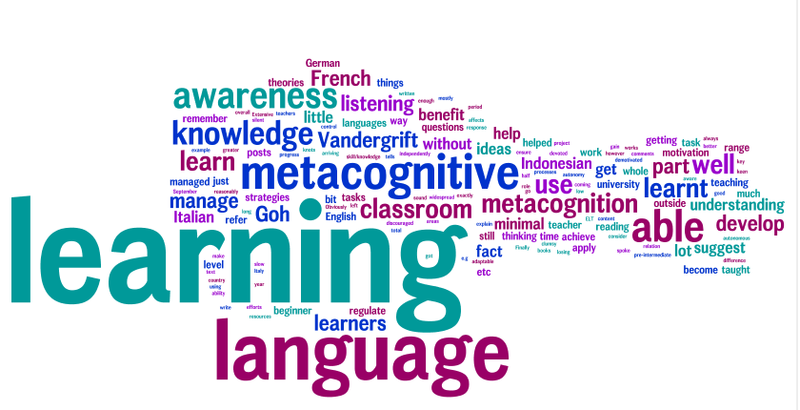 Vandergrift and Goh (2012) contains lots of ideas for developing metacognitive awareness in relation to the skill of listening and a lot of their ideas, I would suggest, are adaptable and applicable to other areas of language learning. I wonder how widespread their use is. Have you used your knowledge of learning theory and language teaching in your own language learning? How? Have you helped your learners to develop their metacognitive awareness and become more able to manage their own learning? How? Course books in the language classroom – friend or foe? Finally, if you have written any posts that are relevant to the theme of language learning and applying metacognitive awareness to your learning processes, or write any in response to my questions, please do link to them in the comments section of this post! Vandergrift, L. and Goh, C. Teaching and learning second language listening: metacognition in action Routledge. This entry was posted in ELT Debates, Learner Autonomy and Metacognition and tagged language learning, learner autonomy, learning theory, metacognition, pedagogy. Bookmark the permalink. I’m not sure it’s precisely about metacognition, but I did write a book review for the Journal of Second Language Teaching & Research on a book called Code Choice in the Language Classroom. There is a section in the book which looks into the reasons why the mother tongue (or any language shared by the learners and teacher other than the target) is used in the foreign language classroom and what it is used for. It was interesting to note from the book that one of the main advantages of using the L1 in the language classroom was actually to talk *about* language learning and what strategies could aid acquisition or provide opportunities for meaningful practice. As I said, I’m not sure it’s exactly metacognitive practice per se, but maybe talking about learning is a start down that path.